I never quite understood why we studied coaches at school. Perhaps it wasn’t explained properly or maybe I just wasn’t interested enough to listen properly but I never got the message. It seemed like a strange topic to spend time on, when battles and escapes, flights and plagues had so much more to offer the half bored history student. And that’s really where I left things until I got to university and began to think about change and progress in more realistic ways. I can’t recall when I realised that Bianconi’s coaches were “a big deal”, but on reflection I now get why we heard about them in school. I get why what seems like small changes can in fact be very significant over time. Bianconi’s coaches after all, arrived at a time when the best transport on the island, remained the rivers and canals. The Grand Canal has only opened for trade in 1894 and its rival the Royal opened for business in 1817. Railways were still some time away and Bianconi offered rapid transport from small communities to other small communities. By linking them it created a network and enhanced the potential for profitable trade and cooperation. 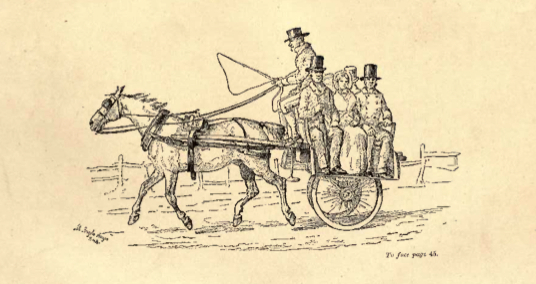 In July, 1815, I started a car for the conveyance of passengers from Clonmel to Cahir, which I subsequently extended to Tipperary and Limerick. At the end of the same year I started similar cars from Clonmel to Cashel and Thurles, and from Clonmel to Carrick and Waterford; and I have since extended my establishment into the most thinly populated localities. I have now cars running from Longford to Ballina and Belmullet, which is 201 miles north-west of Dublin, from Athlone to Galway and Clifden, 183 miles due west of Dublin, from Limerick to Tralee and Caherciveen, 233 miles south-west of Dublin. There are now in the establishment 100 vehicles, including mail-coaches and different-sized cars, capable of carrying from four to twenty passengers each, and travelling eight or nine miles an hour, at an average of one penny farthing per mile for each passenger, and which in all perform daily 3,800 miles, pass through over 140 stations for the change of horses, and consume from 3,000 to 4,000 tons of hay, and from 30,000 to 40,000 barrels of oats, annually, both of which are purchased in their respective localities. The establishment is not at work on Sundays, with the exception of those portions of it as are in connection with the Post-office or canals, for the following reasons: first, the Irish being a religious people, will not travel on business on Sundays; and secondly, experience teaches me that I can work a horse eight miles per day, six days in the week, much better than I can six miles for seven days; and by not working on Sundays, I effect a saving of 12 per cent. The advantages derived by the country from this establishment are almost incalculable; for instance, the farmer who formerly drove, spent three days in making his market, can now do so in one, for a few shillings; thereby saving two clear days, and the expense and use of his horse. The example has been generally followed, and cars innumerable leave the interior for the principal towns in the south of Ireland, which bring parties to and from markets at an enormous saving of time, and in many instances cheaper than they could walk. Excerpt from a Paper read by mr. Bianconi at the cork meeting of the British Association for the Advancement of Science, August 19th, 1843. Written by: Eoinpurcell on 6 July, 2010. Last revised by: John_Dorney4 May, 2012. 3 Responses to "Today In Irish History – Bianconi’s First Coach Service, 6 July"